Here’s a balloon lollipop that stands some two-feet high. It’s a colorful and attractive balloon sculpture that can dress up an event. You can use this as a decoration or you can make and hand these out so people can carry them around. Keep in mind that this one can take time to make and will take lots of practice to manufacture quickly. While the twists themselves aren’t difficult, the creation of the lollipop itself and the handle takes some practice and trial and error. Beginners would be frustrated trying to make this one without a decent amount of experience working with balloons. It’s best tackled by those who have mastered the balloon fundamentals and can easily make basic balloon animals. Due to the nature of this particular balloon sculpture, read all of the instructions first so you have an idea of how this balloon is put together. Since the balloon doesn't lock in place at various stages as other balloon animals do, this will help you be successful and reduce the frustration. 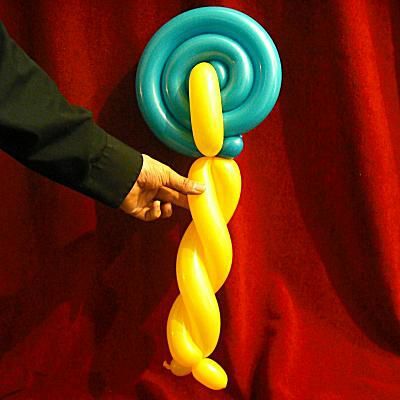 To make this lollipop balloon, you’ll need to have mastered the basic twist. Inflate two balloons to nearly their entire length with only a little bit of slack, say, a quarter of an inch. Take the balloon that will act as the “handle” for the lollipop balloon and find its middle. Create a basic twist in the middle of the balloon, which separates it into two large segments. You’re ready to prepare the second balloon to become the lollipop. Take the second balloon that will make up the “lollipop” and make a basic twist about one or two inches from the knotted end of the balloon. Twist this segment from the second balloon into the middle of the first balloon (the “handle”). You have connected the two balloons together and are ready begin to form the lollipop. Be patient, as this process can take time and you’ll find that the balloon will often slip and negate your work up to that point. Prop the balloon against my body to help it hold its spiral shape. Once you’re done with the winding, you’re ready to secure the coil and work on the handle. Keep a tight hold on the spiral so that it doesn’t come undone. In the next step, you’ll create the handle to secure the spiral. Take the two lengths of the first balloon and hold them tightly against the spiral to secure it. You’ll want the handles to cross over a section of the “lollipop” balloon near it’s end with maybe an inch or two of the end sticking out. Create a basic twist in the two segments of the first balloon so it holds and secures the spiral in place. Again, this may take a few tries and you’ll undoubtedly encounter times when the spiral comes undone. Just keep at it. Take the end of the second balloon and create a basic twist with it at the point just after it crosses the handle, and then twist this into a handle. Everything will be secured. You can secure the handle at the bottom with a basic twist or twist the two ends of the second balloon for its entire length so they wrap around each other. At the end of the handle, create a basic balloon twist with both balloons to lock everything into place.